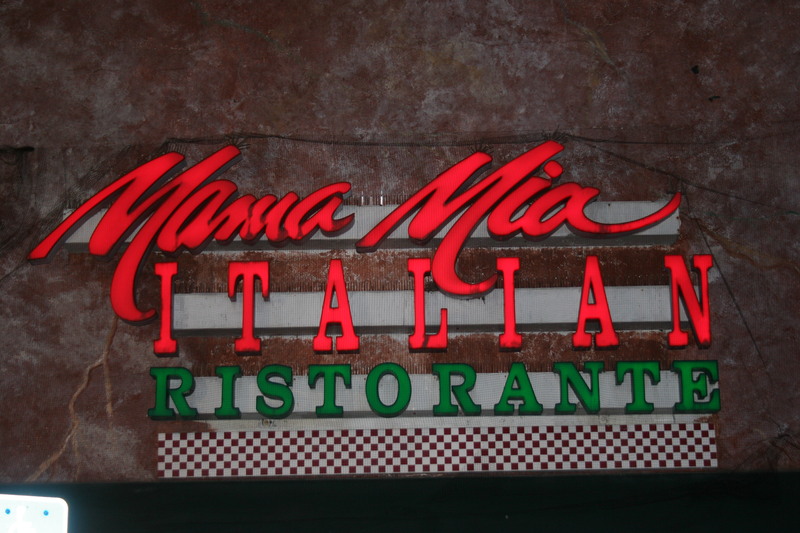 Located at 1818 S. Young Circle in the heart of “downtown” Hollywood, Mama Mia’s was the site of our first Florida dinner last Thursday evening. 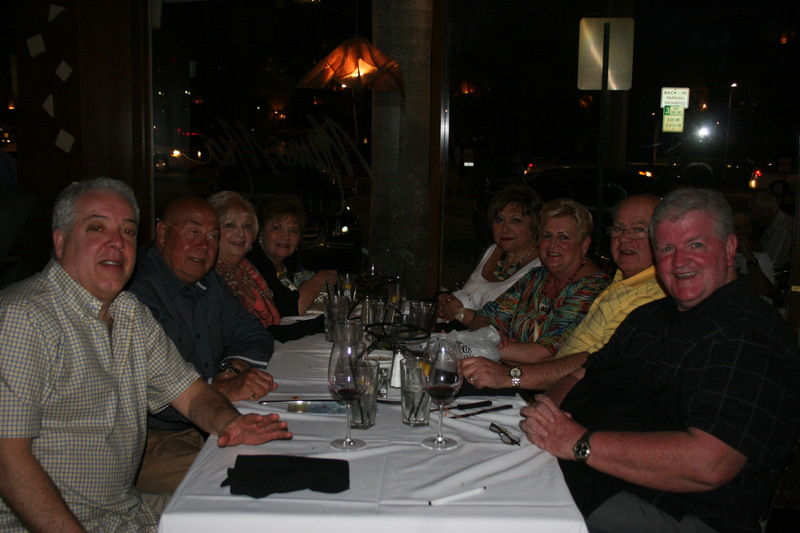 We took advantage of their valet parking and our party of eight were quickly seated in what could only be described as a typical Mediterranean bistro. We looked over the menu while enjoying the warm garlic rolls which Joe B. found “irresistible”. Fool that I am, I was searching in vain for the butter when Joe assured me that adding anything to this bread would be a crime. He was right, they were perfect just as they were. 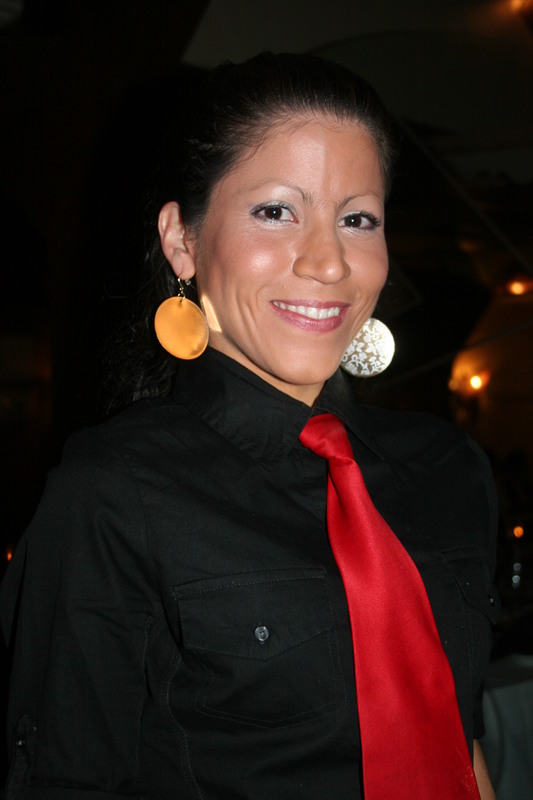 Our server for the evening, Victoria, filled our water glasses, brought us our beverage orders and described the specials for the evening. We took some time thinking about our choices as we continued to enjoy the tempting garlic rolls. 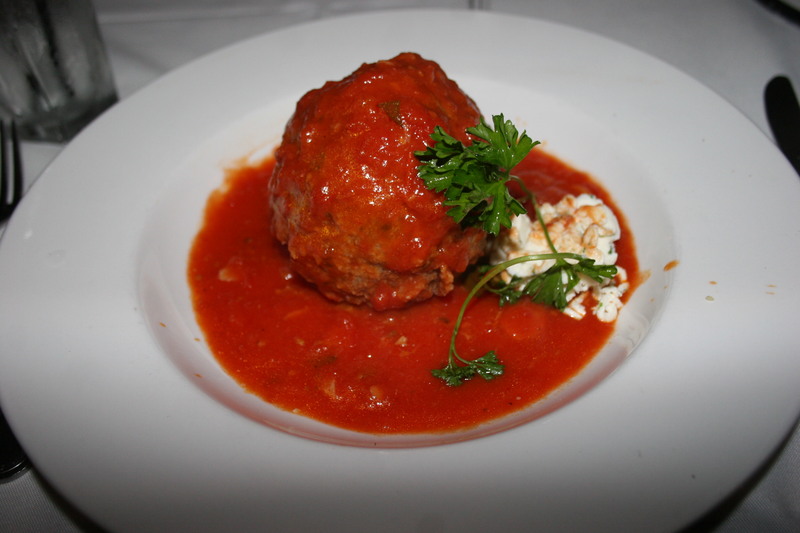 Try as I might, I found no way to avoid ordering the Jumbo Meatball as an appetizer. It came with a tasty marinara sauce and a dollop of ricotta cheese. As the only non-Italian couple in the group, I felt honored that many at the table thought the meatball was delicious. Since their mothers and grandmothers cooked meatballs that few could hope to duplicate, our friends are always apprehensive about ordering meatballs in a restaurant. This one was massive enough to serve as a small meal and had tons of rich, meaty flavor. For my entree I went with the not very adventurous, Chicken Parmigiano served with a nice dish of cappelini. The food was fine, nothing exceptional and because there was no place or time to take some home for later I finished what was a healthy sized portion. Others at our table opted for one of Mama Mia’s specials of the evening. 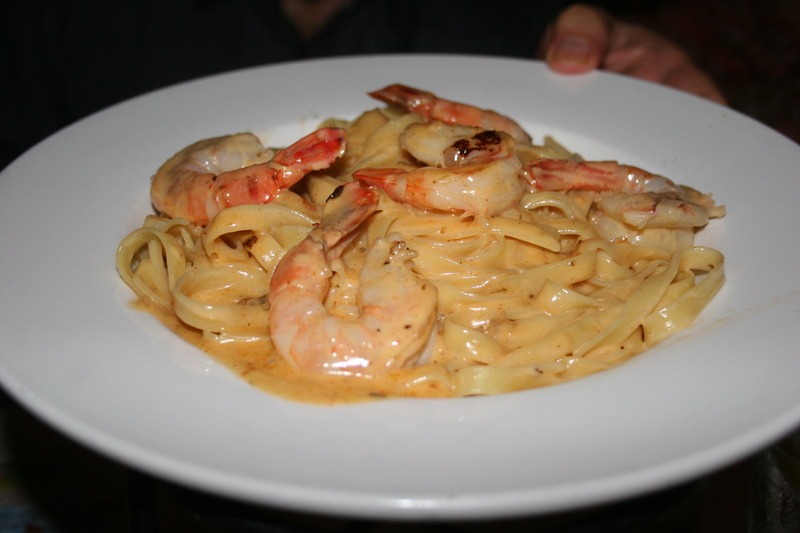 This was the Seafood Louisiana consisting of jumbo lump crab and shrimp sauteed in a creamy lobster sauce and served over fettucine. I heard no complaints from those who dived into this tasty seafood treat. 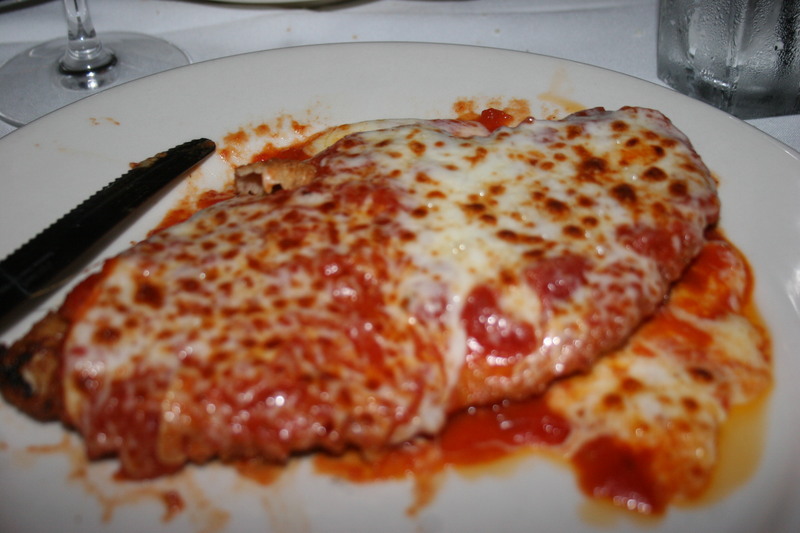 The entree that we had heard about in advance and had garnered a certain notoriety was the Veal Parmigiano. We were warned that the portion was massive. This didn’t stop Joe S. who ordered it and we found it a bit surprising that it was served with the bone in. 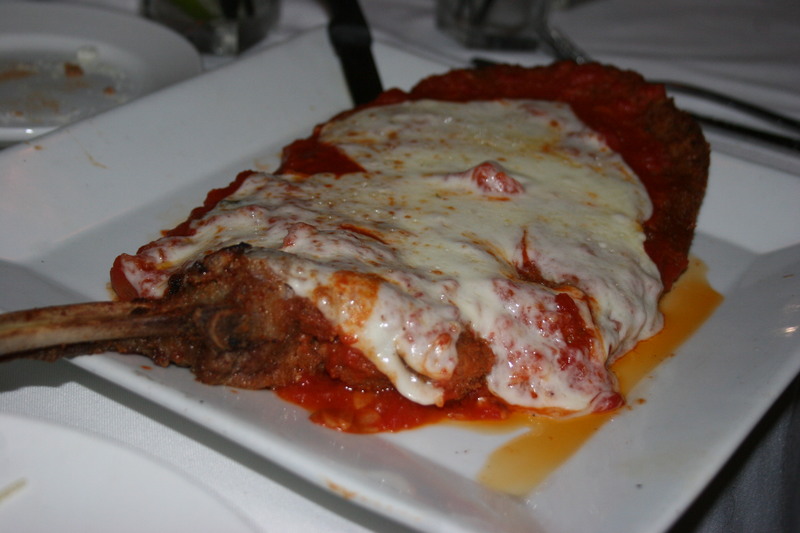 Few of us had ever experienced veal parm served in this manner. Try as he might, Joe was unable to finish the gargantuan offering and actually did take a sizeable portion back to his condo. Unfortunately, I don’t think he ever found the time to finish it and it was probably destined to end up in the garbage. Victoria offered to take a photo of our group and we were dumb enough to oblige. I’m the good-looking guy in the picture. Mama Mia was a good place to begin the first of four nice dinners.